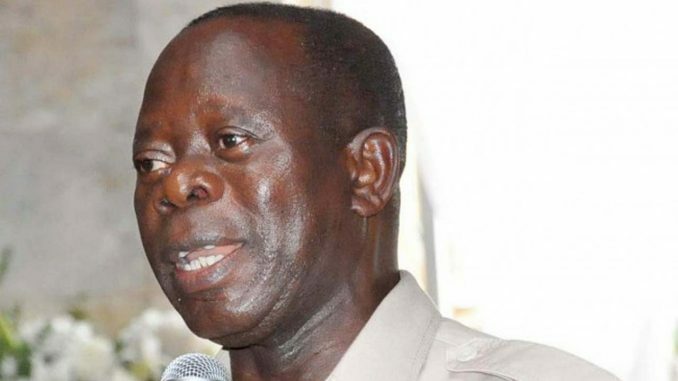 Former Edo State Governor Adams Oshiomhole has urged President Muhammadu Buhari to start the process of probing former President Olusegun Obasanjo to account for how over $16 billion was expended in the power sector when he was at the helm. Oshiomhole, who spoke yesterday at the All Progressives Congress (APC) secretariat in Abuja when he assumed office as the national chairman of the party, urged Buhari to exhibit the courage to probe Obasanjo as he did by putting to rest the controversy surrounding the June 12 presidential poll widely acclaimed to have been won by the late Chief Moshood Kashimawo Olawale (MKO) Abiola. The former Edo State governor, who stated that Obasanjo’s self-righteousness claim was questionable, enjoined party faithful and Nigerians to support Buhari in his quest to rid the country of corrupt practices. Besides, he faulted the former president’s claim of threat to his life in the hands of agents of the state, urging Buhari to unravel the mystery surrounding the cold blooded murder of former Attorney-General and Minister of Justice, Chief Bola Ige and Chief Harry Marshall believed to be politically-motivated when Obasanjo was at the helm between 1999 and 2007. Also, while paying glowing tributes to Odigie-Oyegun, he faulted the notions in certain quarters that the APC was on the verge of changing its “change” slogan. He said under his watch, the APC change slogan would not only remain, but also be deepened and sustained to ensure implementation of the party’s manifestos. According to him: “The man said they want to kill him. No! To kill is to prevent the investigation. He must be alive to account. That is a typical distraction, so, I think all of us should be ready to do anything we can to help Nigerians not to forget in a hurry those who thought they could destroy the fabric of our growth system and render apology later.